What a week! I booked my plane tickets for our annual family trip to the Bahamas and my love life took a nose dive... both good motivators to get back into fabulous shape. 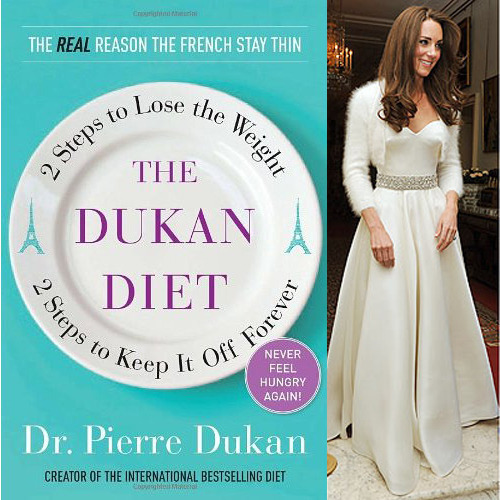 A coworker of mine told me on Tuesday that she was starting the Dukan Diet on Wednesday and asked me to join her. I will admit she got my attention when she said Kate Middleton and other members of her family used it before the Royal Wedding. My coworker had the book in the office, so I browsed through and decided it was something I could stick with. I'm a pretty finnicky eater and don't eat seafood of any kind, so a lot of diets with prescribed meals and foods won't work for me. The diet is comprised of 4 phases, the first of which lasts an average of 5 days-- the Attack Phase. During this first phase you are to eat only lean protein (meat, eggs, tofu), nonfat dairy (milk, eggs, cheese, cottage cheese, sour cream, etc. ), and 1.5 tablespoons of oat bran (I mix this into my vanilla yogurt every morning for breakfast). In the first 3 days on the diet I've lost 6 pounds! My goal is 15, and at this rate, I'll be slim and happy at my goal weight in time for the Bahamas next month. Not every diet is a good choice for everyone, but this news spot from ABC news gives a great video overview of the phases of the diet and how it works, by Dr. Dukan himself. My mum seemed skeptical, since for the first phase there are NO vegetables (or fruit, carbs, starches....) but I convinced her to do the first phase and see if it works for her. She's already lost more weight than I have, and she's a day behind me. Have you tried it? Do you plan to? Got any fab recipes? Tell me about your experiences!